As it is that time of year, we thought people might like to re-read Rosemary FitzGerald’s article about bluebells, which appeared in our spring issue last year. Rosemary contributes articles about gardens and ecology to most issues of the magazine. And you can read all about her here. 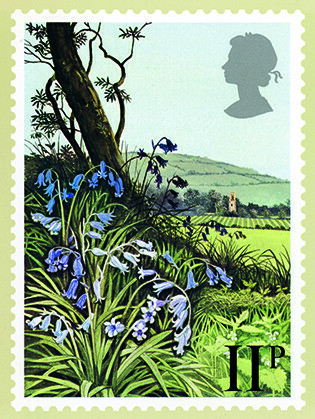 An archetypal scene – ‘Bluebells’ from a set of British flower stamps issued in 1979 (designer: Peter Newcombe). In 2002 the conservation charity Plantlife organised a national poll for people to vote for their ‘County Flower’. Somerset’s, unsurprisingly, is the Cheddar Pink, but the Bluebell votes were so many that it became specially rated as ‘Britain’s Favourite Flower’. It has iconic status in the British flora, and is clearly deeply loved, so it is surprising to find that its nature and existence are beset with problems and, although it seems common, it is seriously threatened in global terms. Even its botanical name seems hard to interpret. Hyacinthoides non-scripta, a hyacinth without writing on it? The origin comes in the ‘not-many-people-know-that’ category – Linnaeus, the great namer of plants in the eighteenth century, had the kind of classical education rarely acquired now, and knew the touching myth of the god Apollo’s cry at the death of his lover Hyacinthus. The heartbroken sound is transcribed by the letters Ai, visible, with a little imagination, in flowers of the true Hyacinth, so he named our unmarked Bluebell, which is in the same family, ‘without writing’. Barton Wood about half way between Rockford and Watersmeet, a mile or so upstream from Watersmeet House on the East Lyn River. Photo by Andrew Wheatley. Bluebells grow throughout Britain and Ireland, in woods and hedgerows, on cliffs, among bracken, in permanent pasture, on roadsides and railway banks, in a wide range of habitats (only really excluding fens and bogs). We are used to seeing flashes of blue from trains and motorways, as well as close to home, and think the species abundant, and it is, still, in these islands. But there is a scary aspect to this abundance, because we have more than half of the world’s Bluebell biomass, and are crucially responsible for its future. Bluebells are a real oceanic species, loving our damp Atlantic climate. They are found in parts of France and the Netherlands and in cooler corners of Spain and Portugal. The distribution forms a thin band across Europe, just reaching the Italian border but not dropping south of the Mediterranean or extending north into Scandinavia, and Britain and Ireland have much the most substantial populations. what we can to sustain healthy populations. The dangers are various, but the biggest general heading must be ‘management’. woodlands can endure 17-year cycles or even longer, making spectacular appearances when the shade is removed. So the species does what it can to help itself survive, but an insidious modern threat is lack of management. 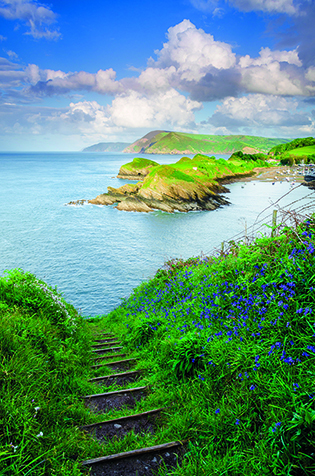 Bluebells also thrive on coastal cliffs, such as this site looking down and across into Watermouth Harbour with Widmouth Head centre shot, Burrow Nose tucked behind and the Hangmans in the distance. Photo by Craig Joiner. This was our cover photo for spring issue 2016. A common misapprehension about nature conservation is that ‘leaving it to nature’ is the best idea, but plants like Bluebells have flourished throughout history, since shortly after the ice sheets retreated, with a great deal of intervention from humans, and our actions have become important to their survival. A highly publicised threat in recent years is the possible corruption of ‘pure’ Bluebell woods with strains of garden hybrid origin. This can happen (though for me suitable management must always be the most crucial factor). Plantlife really raised the matter, in 2003 and 2004, and were very successful in making a wider public aware of ‘Bluebells In Need’. Being ‘hybridised out of existence’ sounds wonderfully apocalyptic, and gave a dramatic focus, but all too often the biggest danger is ignorant and careless management by landowners, and equally ignorant and uncaring management by intensive farmers. Many such people would claim to be in favour of keeping their Bluebells, but traditional management costs money, and has to be properly understood to be effective. Sites can sadly be lost or damaged by default rather than deliberate destruction. 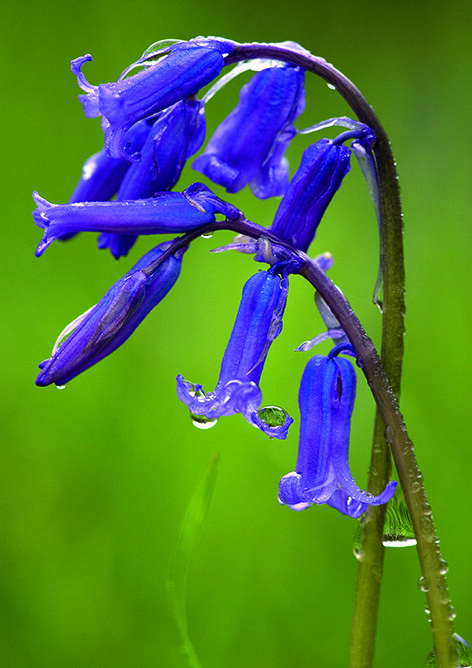 Spot the difference: the true Bluebell has deep blue narrow bells (by Bob Gibbons, Natural Image). But Spanish and Garden Bluebells have paler, outward-facing flowers with light-coloured anthers (by Bob Gibbons, Natural Image). hybrid H. x massartiana (sometimes called the Garden Bluebell) readily occurs. Both the Spanish and Hybrid varieties are vigorous, and almost impossible to get rid of once established, so near Bluebell woods there is often some introgression, but a sudden dramatic takeover is unlikely! A bulldozed ancient hedgebank, or a once-managed woodland now choked with brambles or laurels, are much more probable disasters. There is another threat of which gardeners in particular need to be aware. The ‘wild’ gardening style is hugely popular now, and a little Bluebell wood in the shrubbery is a delightful thought. We are all learning not to take the descriptions in bulb catalogues as gospel, but in this case the ambiguities can be twofold. 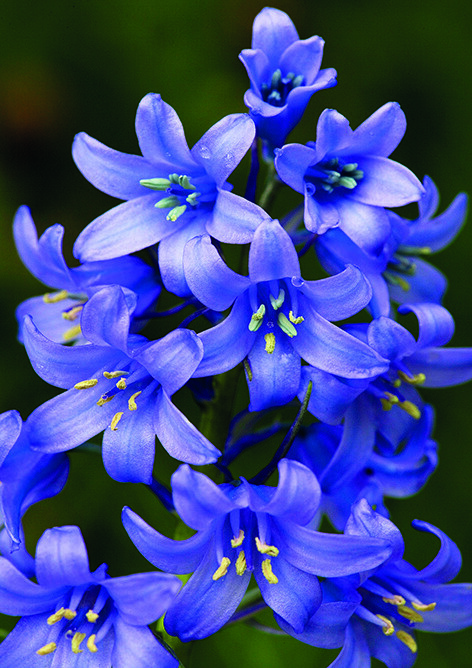 The bulbs you get will often not be Bluebells in fact, but the Hybrid, and even if you get the real thing, can you be sure that the bulbs are ethically sourced? Cases of wholesale robbery of woodland bulbs, dug to sell, are becoming rarer as the Wildlife and Countryside Act begins to show some teeth, but it’s legal to dig wild plants with the landowner’s permission, so there is still a wide loophole for dirty deeds. Please consult the RHS Plant Finder for reputable sources of genuine Bluebells and, indeed, for ‘wild’ Snowdrops, and Wild Daffodils. Be aware! Watch over your favourite Bluebells, and speak up for them if you think they are in danger. TOP PHOTO: Room Hill with Lyncombe Hill in the middle distance (by Andrew Wheatley).